Russian police may be vested with excessive power, as the Soviet days’ legacy, but the recent police reform is expected to bring positive changes. Besides, having your documents in order and knowing the registration and visa laws help to be on good terms with Russian cops. Recent media reports about police reform in Russia are being welcomed by Russians and foreigners alike. For far too long, the police force has had excessive power, something they inherited from the Soviet days. The new reforms call for a name change from ‘militsya’ to ‘politsya,’ new uniforms and better working conditions. It will, however, take time for these reforms to change the mindset and have a positive impact on the morale of the police. On the face of it, the Russian menti aren’t far worse than the pandu havildars of Mumbai or the flics of Paris. Before any Indian who has had bad experiences with the Russian police gets angry with the above statement, I suggest he or she have a conversation with a random African in Colaba and compare notes about police behaviour in Moscow and Mumbai. Police in Moscow and other Russian cities have the right to check a person’s identity documents and it would be prudent to carry a copy of the passport, visa and registration at all times. Equally important is knowledge of and compliance with the law, while in Russia. Some of the former Soviet countries are not particular about registration of visas within 72 hours of arrival, but this is one law that is sacrosanct in Russia. Doing everything by the book doesn’t necessarily ensure a smooth ride all the time. On a long train journey from Vanino in the Russian Far East to Novosibirsk in Siberia, a policeman came into my coupe and asked to see my travel papers. When I showed him my passport, he said that my visa was valid only for Sakhalin and that I needed permission to travel outside the island. He had conveniently forgotten that the Soviet Union collapsed in the early 1990s. After a long argument where I told him that I was free to travel anywhere in Russia with my visa and that I was obligated to register my visa only if I stayed in another city for over 72 hours, he confiscated my passport. “When we reach Komsomolsk-na-Amure, we’ll head to the police station and we’ll see what your rights are,” the policeman said. The next morning at the police station, I expected the officers to reprimand the erring policeman for bringing me there. Instead I was told that the policeman was right and I was violating the law. During the 15 minutes with the police at the Komsomolsk railway station, they tried to throw the kitchen sink of laws at me. “You are in a closed zone, where you need permission to enter,” one officer said. I responded by saying that a foreigner or Russian not registered in a closed zone had 24 hour transit access. Given that Sakhalin Island was a closed zone at that point of time, I was familiar with the rules pertaining to border or closed zones. My knowledge of the laws rattled the policemen. Along with 2 Russian friends, I told them that I wanted someone from the local visa office to come to the police station and sort this out. The officer at the police station told me that I would miss my train if I waited for the officer. When they saw how ready I was to miss the train, they told me that they would let me go “this time, but the next time I broke an administrative offence, I would have to face the repercussions.” They basically knew they were dealing with someone who was a step ahead of them in knowledge of the law and that there was no way I could be charged with anything. Such incidents are highly unlikely to occur on train rides in central Russia. Barring the train incident, my experiences with the police force in Russia have been positive. One spring afternoon in 2003, I was mugged by a group of bandits from Azerbaijan in Yuzhno-Sakhalinsk, in what was my first and only encounter with criminals in Russia. I rushed home and immediately called the police. Within 10 minutes Sakhalin’s finest were at my doorstep and after completely rounding up the neighbourhood, they managed to catch the ringleader. I got my money and watch back, although the bandit managed to sell my ring. The Azeri was convicted and jailed and he had to pay for the gold, which was melted after he sold the ring. Such efficiency is impossible in Mumbai or New York. The cops in Yuzhno-Sakhalinsk told me that if I ever faced a problem again, I should tell any potential criminal that I knew the ‘militsya’ and take the names of a few officers. Of course, I never had another run in with gopniks (small time criminals) after that incident. I was also treated with utmost courtesy at a police station after this misadventure in the wild. 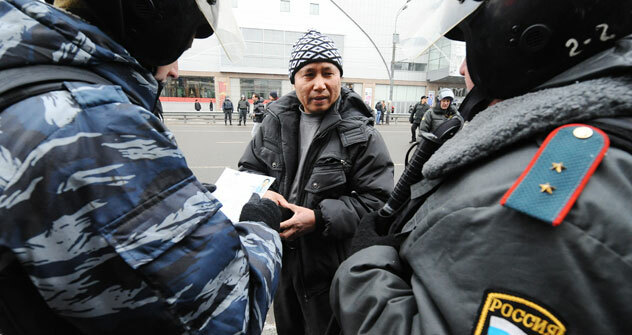 Instances of policemen in Moscow and St Petersburg randomly stopping people for document checks are increasingly rare but it’s still best to be prepared for such a situation. For starters, you have the right to ask a policeman for some identity. There have been cases of ‘fake’ police who speak good English, stopping unsuspecting foreigners and demanding bribes for having the wrong visa or registration. If it is a genuine policeman stopping you, just stay calm and show him a copy of the passport, visa and registration. Never even hint that you are in a hurry to catch a train or a flight. If a policeman insists that there is something wrong with your papers, you can politely suggest that you would like to call your embassy or consulate (Keep those numbers handy, when in Moscow or St Petersburg). If your papers are in order, it is next to impossible for a street encounter with a genuine policeman to last more than a couple of minutes. With the new police reforms and Russia opening its doors for big-ticket international events like the 2014 Winter Olympics and the 2018 Football World Cup, the instances of policemen harassing foreigners are likely to completely come to an end.